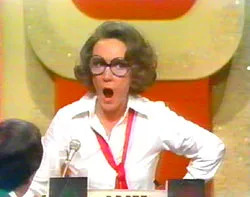 Unlike other classic 1970s TV games shows, the appeal of “Match Game” had more to do with comedy than competition. Quite frankly, no one tuned in to root for plucky contestants or to get caught up in the addictive nature of the game. Instead, the audience was hypnotized by the show’s offbeat personality – something akin to a slightly-out-of-control cocktail party full of wild innuendo-soaked humor. “The Best of Match Game” offers 30 episodes from the daytime cult favorite, where a sextet of bawdy second-tier entertainers traded quips, insults and naughty punchlines. Gene Rayburn was the rambunctious host who barely kept the house in order – his observations on buxom physiques, smooching of pretty starlets and excess delight in setting up the smutty fill-in-the-blank questions added to the program’s adult party vibe. In retrospect, it is astonishing that much of the show’s material was able to get past CBS censors – clearly, there were no other programs on daytime television during that era that provided such blatantly suggestive humor. (The notion of Ronald McDonald posing naked for Playgirl Magazine was actually among the tamer jokes!) If the show left very little to the imagination, it clearly offered plenty of attention to the funny bone. Posted in Film Reviews, Side Shots Film Blog and tagged DVD Reviews, Game Shows. Bookmark the permalink. Trackbacks are closed, but you can post a comment.